Some of the best moments in the day are the ones spent with your baby, so make the most of your precious time with this Graco's DuetConnect Swing and Bouncer. This ingenious baby swing chair has a seat that doubles as a bouncer, giving you the flexibility to move around the house while keeping your baby cozy and close-by. With added features such as two-speed vibration, six swinging speeds, classical songs and nature sounds, the baby swing and bouncer has all the options a baby will love. It provides a great way for babies and parents to take a break and can help to calm your little one by a gentle rock or a vibration motion. 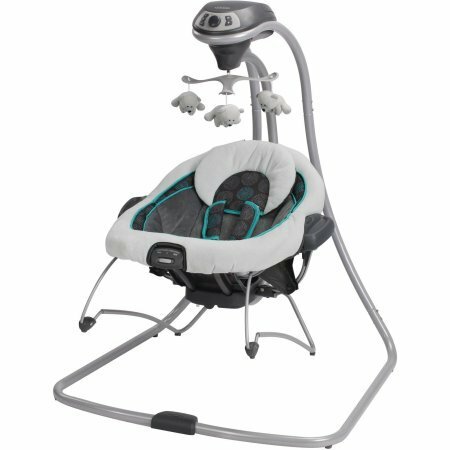 The Graco DuetConnect Swing and Bouncer makes a great gift for any mom or dad to be.